Deal agreed before EU ministers meet to discuss Ireland’s bailout details, but no confirmation of interest rate. A DEAL HAS BEEN REACHED ON Ireland’s joint EU/IMF bailout, according to Reuters. European ministers reportedly wanted an agreement before the markets re-open tomorrow, in an effort to prevent investor fears over Ireland’s debt spreading further into the eurozone. European finance ministers meeting in Brussels to discuss the details of the package today and to confirm the deal, the BBC reports. Simon Carswell told RTÉ Radio One that the ECB, EU and IMF have agreed a bailout with Ireland, and the European ministers are in the process of signing off on the deal at the moment. Carswell said the IMF was likely to impose lower rates on Ireland than the European rates. He said EU rates were “punitive” in order to limit the number of countries which would call for such a loan. Reuters reports that the EU ministers are expected to sign off on Ireland’s €85bn deal at that meeting, after a source said that the negotiations had ended and a package was “agreed on the ground” in Dublin. No details have emerged on what interest rates were agreed upon for the repayment of that €85bn package. Yesterday, economist David McWilliams said that the speculated figure of 6.7% interest would simply “sink the country”. Speaking on RTÉ later yesterday, Minister Eamon Ryan denied that the rate would be that high. McWilliams said Ireland was likely to pay more for its bailout than Greece, which was charged 5.2%. 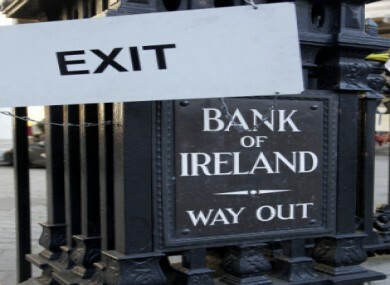 The EU reportedly pushed for Ireland’s bailout so it could be concluded before the markets reopen tomorrow morning. Fears that Ireland’s banking troubles could spread to Portugal, Italy and Spain have seen European officials downplay the links between the countries, according to Reuters. The Portuguese and German governments and the ECB denied that Portugal was coming under pressure to accept a bailout as the country’s bond prices rose last week. Email “EU/IMF bailout has been reached ”. Feedback on “EU/IMF bailout has been reached ”.